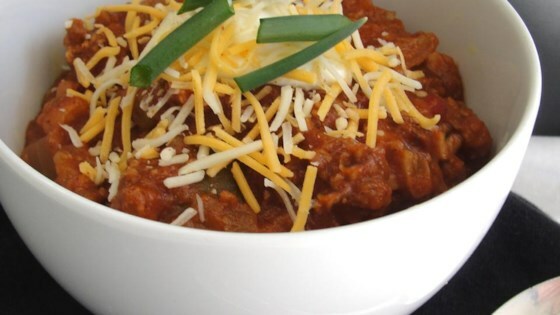 Break ground beef and sausage into small pieces and put into the crock of a large slow cooker; add tomato sauce, dark red kidney beans, roma tomatoes, celery, green bell pepper, light red kidney beans, white kidney beans, beer, sweet onion, red bell pepper, tomato paste, green chile peppers, chili powder, chipotle peppers, adobo sauce, cumin, and barbeque sauce. You can cook this on low on the stove in a large pot for 2 to 3 hours. Good recipe but too much for one crock pot unless there is a giant size out there I am not aware of. You need to 1/2 this one for sure or cook in two different pots. Taste great though. I didn't add the sausage but came out great! I made it as is, over a campfire. It was delicious! Everything tastes better over a campfire. My family and I loved it! I especially liked not having to brown the meat first and all the fresh vegetables that went into the pot.